Kari Jobe’s potentially awkward moment turned into a beautiful moment for healing hearts. When an awkward lull happened at the Designed for Life women’s conference I attended a couple of weeks ago, I immediately knew what was going on. I’ve not been pregnant yet, but with all of my kidney issues, I can relate to those frequently visiting the bathroom as their baby(ies) press(es) on their bladder. The host, Pastor Debbie Lindell took the platform for an unplanned speech to help transition the evening service. There was a band already set up on the stage and I knew Kari Jobe was scheduled to sing some during the conference. I also knew she was in later stages of pregnancy and I laughed as I realized that she was probably in the bathroom. I had just slipped back into my seat from the bathroom right as a video ended and Kari was scheduled to lead worship. Debbie jokingly asked if any women remembered being pregnant and their frequent potty breaks as Kari took the stage. Debbie then explained to Kari in front of about 9,000 women that she’d just told us that she was peeing! Kari confirmed this report into the microphone much to the amusement of all those attending. When Debbie left the stage Kari shared how she wasn’t just using the bathroom, but she’d been cleaning off her smeared make up as well. She told of how her sister who was pregnant at the same time as her just lost her baby two weeks earlier. She was 7 months along and had a still birth. There was such a sweet presence of God in the auditorium that evening as we worshiped together which was healing her heart. At one point she looked up and a woman with her little baby girl came and sat in front of her and more tears fell. What began as laughter quickly turned into tears as we all listened to her story through her choked up words and rawness. She went on to say how through this experience she’s realized that religious clichés don’t help-they actually shut someone down. And I lost it. I could relate with her now far more than just our frequenting the bathroom. She’s right. When you’re in the midst of pain, loss, or suffering you don’t simply need to hear, “God will turn this around for good”, “God will come through!”, or “Just have faith”. Nothing against anyone who thinks like that or has said those statements to someone as we’ve all been there. It can be awkward when we are confronted with the pain and suffering of another person. It often is a strange interaction, so when we as believers don’t know what to say we often say something we think sounds spiritual. Maybe the thought process is,”if I say a scripture then I’ll be helping”. Or maybe we’ve never felt the pain or faced the difficult scenario they’re in so we think there’s an easy answer, “just have more faith”. Yet none of those things help. In all I’ve faced particularly in this season of life, I know that God is good and I know that He is going to work things out in my life for the good…”because I love him and I’m called unto His purpose” (Romans 8:28). It isn’t that I don’t believe in His goodness or that I’m not focused on the truth of God’s word. It’s just that walking through some situations are difficult and they demand more depth than a surface response. When you’re walking through the questions and suffering the heartache of your circumstances, it isn’t helpful to find yourself shut down by others’ replies or by their silence. When you feel confused about God or you’re trying to see truth through the sometimes murky and violent water of trials, you don’t want to be simply told that God is good. When faced with that doctor’s report you weren’t prepare to hear, having someone exclusively say, “God’s got this” as you wrestle the fears and make difficult decisions isn’t helpful. You need to experience His goodness THROUGH others. You need to experience His love encompassing every area of your life, including your questions and perceived failures. You need to be ALLOWED to cry and really feel what you’re walking through and invite Jesus into that place of pain. Sometimes our words can shut down someone’s heart from allowing real healing to take place. I realize that facts about a doctor’s report or situation are subject to change. I know that we have all power and all authority through Jesus. I’m not denying that focusing on the TRUTH of the word of God isn’t applicable. It ALWAYS is and that’s exactly what needs to be focused on, but not at the cost of invalidating what someone is walking through and not being willing to walk WITH them through their pain. We must be willing to look to the example of Jesus and how He walks with us in this life. Jesus came to take on our flesh so that He would relate to our flesh both in victory and in sorrow. One of the most impactful things that has ministered to my heart happened two years ago during a really challenging time in my life. I had been really sick for almost a year with various tropical illnesses, small seizures, and I was dealing with constant pain from misaligned ribs and hips from a car accident that caused great pain even with walking. Stephen and I decided to get away for a few days and our trip happened to fall around the anniversary of my cousin’s death. My cousin was my best friend and we’d grown up together as she was four months older than me. She battled cancer for 7 & 1/2 years before dying when we were 14 years old. Due to the difficult season I was in and our constant travel schedule, I was really lonely. 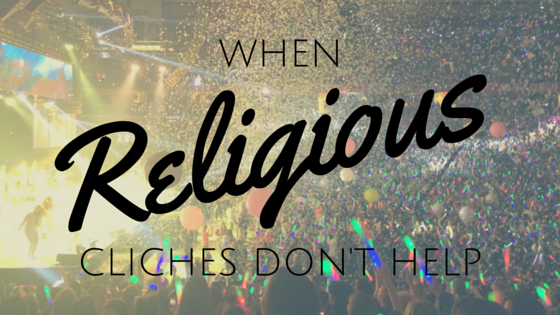 Some people had said awkward things to me concerning my faith while others just pulled away. Other friends simply weren’t able to encourage me face to face as we were traveling so frequently. This caused me to grieve my cousin’s loss in a new way that year. One morning on our trip, Stephen took me outside and shared how he felt like he had a word to share with me. He sat me down and said that while he was praying that morning that he felt like Jesus said, “Tell Bailey that I know what it’s like to lose my cousin and I’m crying with her”. The words hit me like a load of bricks upon my chest and as I began to cry I felt something break off of my life. I felt the nearness of Jesus more in that moment than I had in any other moment of my life. Not because this was a happy moment that He was meeting me in, but because in my pain and sorrow, He met me and was crying with me. That made me want to pour my heart out in adoration and worship like never before. I want you to know that no matter what you’re walking through or how lonely that you’ve felt in your heartache, Jesus is with you. He has experienced pain, suffering, sorrow, and sadness. He did this all the while being filled with the Spirit, in complete surrender and obedience to God’s will and fully knowing that His Father was good. Just because He was the Son of God who died for our sins doesn’t mean that he didn’t feel the pain and weight of our sin or the sorrows of this life. He can relate to you and speak to you more than any human ever can. As religious Christianese circulates around you and questions stir within you, I encourage you to press past those voices and listen for the voice of Jesus. Hear what He is saying and let His love draw near in your time of hurting. Don’t allow your painful circumstances to steal your praise of the One who is worthy and wants to pour out His love. He hurts for you and He hurts with you. Worship Him and let the disappointment, offense, mistakes, and fears fall off. Lean on Jesus and get back up again–you were made to live victorious! Well said Kari–thanks for sharing your heart and bringing others to the place of healing in Jesus. This entry was posted in Kuert Life and tagged crying, Designed for Life, disappointment, fears, healing, HOPE, jesus, joy, Kari Jobe, pain, sorrow, tears, truth, victory, worship on October 29, 2015 by Bailey Kuert. 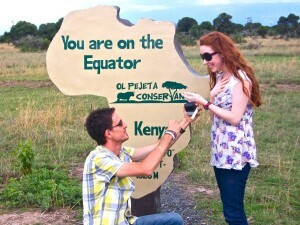 When my husband Stephen proposed to me on safari, on the Equator, in Kenya, you’d think I would’ve caught every.single.word. that he said. HOWEVER, because of the location where he proposed, I was preoccupied with why the ring was placed in the wild African plane for any roaming animal to stomp or tourist to steal. Sweet Steve is on his knees pouring his heart out with a cut-out of Africa behind him and I’m only thinking, “HOW DID THAT RING GET THERE?!“. I quickly found out that his buddy, Sach, who was with us placed the ring behind there right before we started taking pictures. I was shocked! Now I had a ring with two rubies, a diamond, and yellow gold on my hand and it was a little loose. What a special gift though. I’ll have to tell the whole story of what happened with this ring later and how God spoke to me, BUT the point for now was that it was a special gift. A symbol of our lives about to start together–forever. No more thousands of miles separating us. I cherished that ring and never took it off once it was sized. I clung to it the entirety of my Africa trip as to not lose it. Yesterday as I was sitting in a church service, I heard something in my spirit unrelated to the message. I began to think about what a gift the Holy Spirit is. To have fellowship with the SAME spirit that raised Jesus Christ from the dead. To have the ability to communicate with the Father and Son and reveal all things to our spirits here on earth! WOW! Jesus said when He left the earth that He wouldn’t leave us as orphans, or those without guidance, but that He would “come to us” (John 14:18). TO be perfectly honest, in that moment, I was thinking about how much I’d let the BEST gift ever given to me get pushed aside recently. I clung to my wedding ring more than the gift of Holy Spirit! How could I treat the Holy Spirit as a sideline gift while taking care of more material things like my wedding ring, my car, and other possessions? Friends, He is our best gift. And it is the best unused gift in this generation. Our generation doesn’t need more material possessions or titles and positions. It needs a move of the Holy Spirit. We have access to the greatest gift on Earth! Not to hide Him away or forget about Him, but to display Him in and through our lives. To strengthen us and reveal more of the love of the Father and Jesus to us. What measures have you taken to keep a precious gift from being lost, ruined or stolen? Say: “Jesus, I make You the Lord of my life. I’ve sinned against you and I receive Your cleansing blood, Your work on the cross, and Your resurrection from the dead. I turn from my sin and I give my life fully over to You. Come and live on the inside of my heart, mind, emotions and take over my will. Fill me with Your Holy Spirit. I love You–thank You for a new life in You! I receive Your love, Your mercy, Your forgiveness, and Your best gift ever–Holy Spirit. Amen” :) Congratulations!!! You now have the best gift EVER AND the gift of Him being with you always and forever! This entry was posted in Give Up 40, Kuert Life and tagged devo, giveup40, holy spirit, jesus, prayer, worship on February 23, 2015 by Bailey Kuert. I looked at my husband at a point today and said, “Can you read my mind?”, to which he replied, “Can you read mine?”. We both ended up chuckling because we in fact knew what the other was thinking. Some days I make it hard on my sweet husband though. I don’t even know what I’m thinking or what I want and/or need, so I can’t expect him to know. But some days I learn new things about myself that I didn’t know before. Often this comes from times spent in my husband’s company or in a conversation with a friend. Mostly I learn more about myself by spending time with my Father. He after all is the One Who created me and knows me for who I really am. He isn’t guessing, assuming, or basing His assessment on perceived information. He knows the facts about me. He knows me. He knows the good, the bad, the GREAT, aaaaaaand the ugly. He knows the plans that He created you to walk in and the unique traits, personality quirks, and giftings inside of you. When you spend time seeking Him and desiring His will for your life, He’ll reveal the best for your life and in the process you’ll learn His heart. Do we really believe that He knows us better than anyone else? What ways do we believe other voices including ourselves over His truth? What can we do to listen to His voice and truth in our lives? Ps 139: 1 You have searched me, LORD, and you know me. Comment below on how God has been speaking to you the past couple of days. Missed a blog? Check out the category on the right margin for “Give Up 40” and use the hashtag #giveup40 for reposting and comments. This entry was posted in Give Up 40, Kuert Life and tagged devo, giveup40, He knows me, jesus, prayer, word, worship on February 19, 2015 by Bailey Kuert. Wanting to give up something for Lent this year or desire a more strict focus on Jesus as you head towards Easter season? Why not give up your time to spend in His Word? I used to give up Oreos in Middle School for lent…no joke ;) It was a sacrifice for me back then and likely prepped me for more food fasting later on. We can either give in to the enemy’s plans for our lives, OR surrender ourselves to Jesus Christ and give up our lives for Him. Whether or not you participate in this 40 day fasting ritual, there’s something to be said about going deeper with Jesus and learning to give up our lives for Him. In the hour that we’re living, there’s certainly a constant need to surrender ourselves to the way of the cross and allowing Jesus to truly be Lord of our lives. I think of the 21 Egyptian men who were just martyred for their faith in Jesus Christ in Libya and I recognize their life was not their own. Their lives weren’t taken from them, they willingly gave them up to Jesus long before the moment of their physical death. We too are invited to submit ourselves to His way and to learn His heart. I invite you to join me on this journey of “Giving Up” our lives to be more like Jesus during the 40 days of Lent. This entry was posted in Kuert Life and tagged devo, jesus, lent, worship on February 17, 2015 by Bailey Kuert. 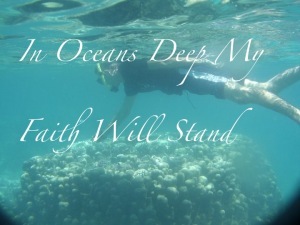 When I read this blog recently titled “Stop Singing Oceans”, I honestly was bothered a bit by it. While I understand what the author (who clearly loves Jesus) intended to say by indicating we sing songs in worship that we don’t fully act upon, I must say that I have to disagree largely with her thoughts overall. This blog is not a rebuttal necessarily, but merely a composed testimony of my experiences with worship songs. I wasn’t raised going to church, therefore I am coming at this from both sides of being unchurched and being a church attending gal ;-) . When I truly met and encountered Jesus, I was wild for Him. In my wildness, I wasn’t mature and said and did things that reflected I was definitely a baby Christian. When I began my walk with the Lord, I didn’t know anything other than that I was so in love with Him. I would attend every possible church service that I could and I absolutely LOVED worship nights! I didn’t know that I could/couldn’t should/shouldn’t do this or that. And I certainly didn’t filter my songs to Him. I sang about surrendering my life when I was selfish and not very surrendered. I sang about only loving Him when really I had many other “loves”. My heart was in the right place though and I kept singing. I still remember the first time I heard the song, “You Said”, while watching a mission’s video of Haiti at the church I got saved at. The lyrics gripped my heart as Rita Springer’s version of this song filled the footage of many broken lives in Haiti. I became obsessed with the song and constantly sang with tears in my eyes, “You said “Ask and I’ll give the nations to you…” Oh Lord, that’s the cry of my heart…distant shores and the islands will see Your light…Oh Lord I ask for the nations”. The truth is I had NO idea what I was praying or singing out literally, but I felt it so deep within my spirit. I didn’t know that in fact my first full-time missions assignment would be to live on the distant island of Madagascar some 12 years later. Fast forward to 2007 when I wrote these lyrics on my mirror (in hot pink lipstick of course) “Heal my heart and make it clean. Open up my eyes to the things unseen. Show me how to love like you have loved me. Break my heart for what breaks yours. Everything I am for Your kingdom’s cause. As I walk from earth into eternity”. These lyrics are from a song called, “Hosanna”, by Hillsong. I felt those lyrics so passionately in my spirit as I sang them out, but again how could I know the fullness of what I was praying? I’d cry as I prayed and meditated on those lyrics because the truth was, I wanted a healed heart that could understand His heart. I didn’t want to be hardened by the world around me and not be moved in compassion and love for others. I did not know what singing those lyrics would produce in me. When you sing words like that, you can expect opportunity to grow and mature. Those words ended up launching me into a season of discovering the love of God like never before. When Stephen and I were getting married, our church wedding coordinator was against us having live worship music for some reason. It was a battle I fought for because we wanted to set the tone of worship for our marriage. We weren’t merely pledging our love to one another, but we were doing so in commitment to the God we love and serve and we wanted to sing about it. When I had first heard that song, I wrote the lyrics down and knew I wanted to sing it on my wedding day. Stephen and I chose to declare in front of God and all of the witnesses celebrating us that we would stand for Jesus no matter what comforts or what trials we would walk through in our marriage. We had said, “Yes” to Him as singles and we now committing to saying, “Yes” to Him as a married couple. Little did we know the events that would follow just days after when I got incredibly ill on our honeymoon and then we got into a serious car wreck shortly thereafter. 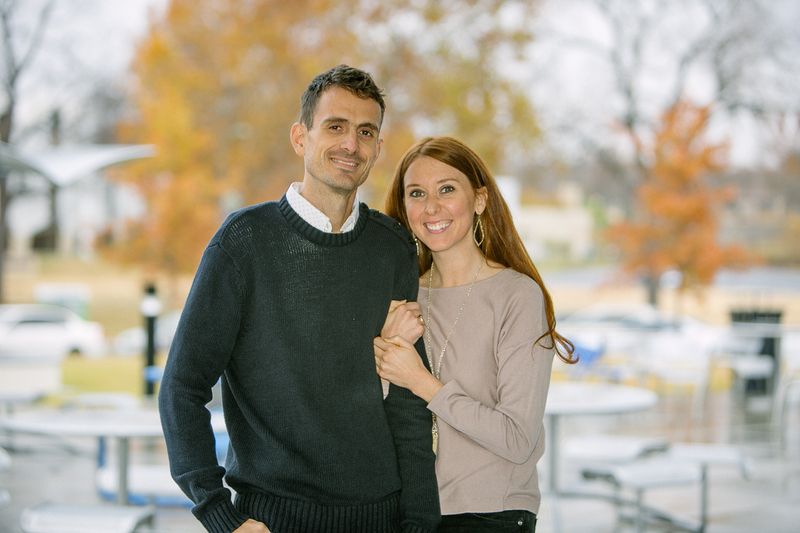 We didn’t know that our “yes” would be tested and tried and that we would spend the majority of our first two years of marriage in doctor’s offices and walking out many physically trying situations. However even in the darkest and most trying times, our hearts still sing, “I just want a heart that is fully in love”. That song has comforted me more today than when I sung it on the happiest day of my life. THEN came the time that I first heard the song, “Oceans” by Hillsong at a supporting church of ours that my husband was speaking at. I almost didn’t show up to the services that morning because I was so weak physically. The anointed worship leader and his wife sang this song out with the rest of the band and I let out an ugly cry (kind of like I did the night I met Stephen when he preached about missions ;-)). My spirit came alive and I was infused with this glorious empowerment in my spirit that revived my faith. I knew God was calling me out of comfort. I knew I couldn’t control what was happening to my physical body or anything else in my life, but I could trust in Him. I knew I was being asked to surrender it all. I sang out loudly and boldly. Second service came around and more ugly cries came forth. This song carried me in the following months of our move to Madagascar and it stands as a reminder to many to pray for us whenever they hear that song. As challenges in life have come, I’ve stood on these lyrics I’ve mentioned above. I believe that God has met me in my places of singing to Him. I believe some lyrics open my heart to cry out to Him and depend on Him to grow and perfect my faith as I seek Him. I realize that any worship song could be just “lip service” to God and that some people sing “Oceans” and don’t mean a lyric of it. But what if one person means it? What if one person receives a call into missions because they sing it? What if one person gets freed from an addiction because of it? What if one couple decide to hold onto the covenant they made with one another because of hearing it? What if a brother or sister in Christ sings this to steady their faith in the midst of persecution? Is it worth singing it then?? Worship leaders, I’ll address you and say to you—PLEASE keep singing “Oceans”. You may have a redheaded girl who just needs to remember He’s never failed her and won’t now. Maybe the problem is that you aren’t signing it enough! Maybe you just need to sing it more until it becomes so redundant in your head that it finally becomes a conscious thought. As you sing, realize God will honor your words and He will nudge you to step outside of the borders that you’ve erected for your faith. The song says, “there I find You in the mystery in oceans deep, my faith will stand.” You might just be surprised at where you’ll find Him in your everyday life and let’s be honest–everyone’s faith needs to be encouraged. EVERYONE certainly needs to know “I am Yours and You are mine”. God NEVER says “Stop singing” anywhere in His word. He loves for us to be free to worship Him and to live lives that reflect His glory and not our man-made statues and limitations. He doesn’t want us to be intimidated by singing songs because somehow we think that we’ll never be able to live extraordinary lives for Him. If I had not prayed challenging prayers, I wouldn’t have grown in my faith. If I had not dreamed dreams that only God have placed within me, I would be living confined in my own comfort and plans. I certainly wouldn’t be a missionary or writing this blog. There you have it…My opinion on singing bold and crazy lyrics. Lyrics that our minds may never fully comprehend, but ones that speak life to our spirits and dare us to move beyond our natural lives and into the supernatural ones that depend on a BIG God. Oh and if you’ve never heard the song “Oceans”, do yourself a favor. Give it a listen. This entry was posted in Kuert Life and tagged devo, hillsong, jesus, joy, missionary, missions, oceans, praise, rita springer, salvation, singing, worship on October 6, 2014 by Bailey Kuert.